I have been experimenting a lot the last 6 weeks with growing oyster mushrooms- and finally had some success. Time to jot down a few of the things I have learned. Happy oysters (pleurotus ostreatus) 15 days after inoculation! Second harvest of oysters growing already on day 19. Mushrooms really care about their environmental conditions. Hit the sweet spot for temperature, light, humidity and airflow, and they are champs. Too high or too low in any 1 variable and you have sadness (and no mushrooms). Oyster mushrooms will grow on lots of things. So far I have seen good growth on: shredded paper, coffee chaff, coffee grounds, coffee jute bags, hardwood pellets, and rye grain. Nothing surprising here, but neat to see it. Too much moisture in your substrate (growing material) is a real killer. Better to have non- sterilized substrate at the right moisture than sterilized and too wet. If a culture is given the right conditions it will grow like crazy. I made up 8 containers with different moistures, materials, etc.. and a couple grew like crazy. Just 7 days after mixing the spawn into freshly sterilized rye grain primordia was already forming. I harvested 10 ounces of mushrooms from 1 block on day 15! (see first photo). Spawn bags with a filter patch are pretty awesome. Limits contamination and allows fresh air in. Totally worth the cost (~$0.50/bag). It is late October, and the mushroom season is on the verge of ending in Rhode Island. 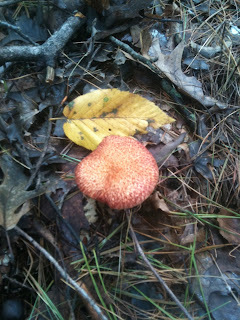 Normally this would be a sad time in mushroom land, as there are a good 7-8 months before wild mushroom foraging really returns to New England. But not to fear- for we can grow mushrooms indoors (and no, not those mushrooms)! There are several species that can be grown fairly easily on sawdust or cellulose based materials (paper, wood chips, cardboard, coffee waste, etc...) including oyster mushrooms, shiitake, lions mane, hen of the woods, and more. Full disclosure here- this end of mushroom season gloom hits me every year, and I have tried to grow mushrooms each of the last 3 years as the cider and pumpkins appear. The first year I grew an oyster mushroom kit on coffee grounds and actually had a little success. Probably 8 ounces of oysters that were pretty darn tasty- but not a great return on a $24 investment (plus shipping) and over a month of work. The next year I decided that I wanted more mushrooms for my investment, so I spread the spawn over 4 buckets. Seemed like a good idea. End result was not enough spawn per bucket, and no mushrooms grew. The year after I ordered my oyster spawn, but I was busy and ended up not inoculating the spawn for 8 weeks. By the time I mixed the spawn, it was pretty tired and the mycelium never took off. No mushrooms. This brings us to 2011- this year. With all the mistakes I have made and lessons learned, I am convinced this will be the grand success. I will write up a summary when done- but for now here are the results as they happen. Oyster mushroom spawn from Fungi Perfecti. Two oyster mushroom kits ordered this year- for twice the fun! I decided to use some different growing materials- coffee jute bags (that hold green coffee), and coffee chaff (a byproduct of roasting coffee- a full day of roasting creates a full bag of husks/parchment/bits of coffee beans). I knew that I couldn't spread the spawn too thin, and that I needed to pasteurize the growing substrate. So I heated a big pot of water and boiled the coffee chaff and bags for 15 minutes. (In retrospect I should probably have boiled it for longer- perhaps 45 minutes to an hour)? Then I mixed two smallish bags of boiled chaff (about 2 pounds each) with 1/4 bag of spawn each, and 1/4 of a bag of spawn in each of 6 boiled jute bags (I spread the spawn on the open jute bag then rolled them up tight). Here comes another mistake. I put the chaff and jute bags into clean plastic bags, twisted the end of the bag and tucked the end under each bag. I figured that since oyster mycelium grows well with high carbon dioxide levels, having a nearly sealed bag would not only keep the moisture in, and contamination out, but would allow a lot of carbon dioxide to build up in the bags- promoting rapid mycelial growth. Spawn on jute bag before rolling it up, and rolled bag. I put all the bags down in my basement (which was at about 72 degrees) on wire racks. Fairly dark and humidity around 60%. An important detail- I used one of the spawn bags to hold one of the jute bags, which had a filter patch on it- allowing some air flow, but not contaminants into the bag (it also had mycelium on the inside of the bag which might have helped). Finally when closing the two bags of coffee chaff, I didn't twist the bag ends I just folded the end under the bag loosely- which allowed more air flow. Signs of mycelium growing in spots in all the bags. Looking good. Some trouble. 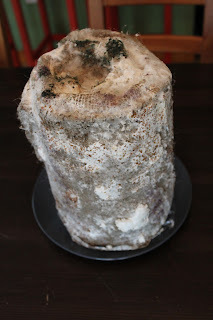 The mycelium that was growing robustly a few days ago, has slowed down and apparently decreased in several of the jute bags. The 1 bag that has the filter patch shows some signs of green mold near the bag opening, but also has excellent mycelial growth. The two bags with chaff are both growing pretty well- the mycelium is starting to hold the chaff together in a brick. Primordia is starting to form in one of the bags with chaff, and on the jute bag that has the filter patch! I moved the two chaff bags, and the jute bag upstairs. Oysters need light to fruit, and the warmer temperatures also help with cropping. spawn. Primordia forming low on bag. I cut the bag down to the level of the chaff, put two chopsticks in each log (to hold the humidity tent up) and covered the logs with a plastic bag with some holes in it to keept the humidity high. The challenge is to maintain high humidity AND good airflow. Without fresh air the oysters grow long stems, and no caps. But if the humidity drops too low, they dry out, crack and stop growing. A tricky balance. I placed one chopstick in the jute bag and covered it in a humidity tent. Fully colonized brick of coffee chaff. Ready for fruiting! Primordia/baby mushrooms are growing on the jute bag and one of the chaff bags! Primordia stopped growing on the chaff bag- not sure if the humidity dropped too low. Mushrooms almost ready for harvesting on the jute bag- just one cluster but it is a start! Day 23- almost time to pick them. October 21st - Day 24! Time to harvest my first oysters of 2011. Oysters are dropping spores (visible on table). Last night spores started dropping from the cluster, a sure sign that the mushrooms are just about mature. This morning there are lots of spores- harvest time! They are not as big as I would hope- but at least there is something. There are a couple mushrooms on the chaff bag that are growing huge long stems. Presumably too high CO2. I created a larger humidity tent from a big plastic bag- so hopefully that will help some. Chaff brick. 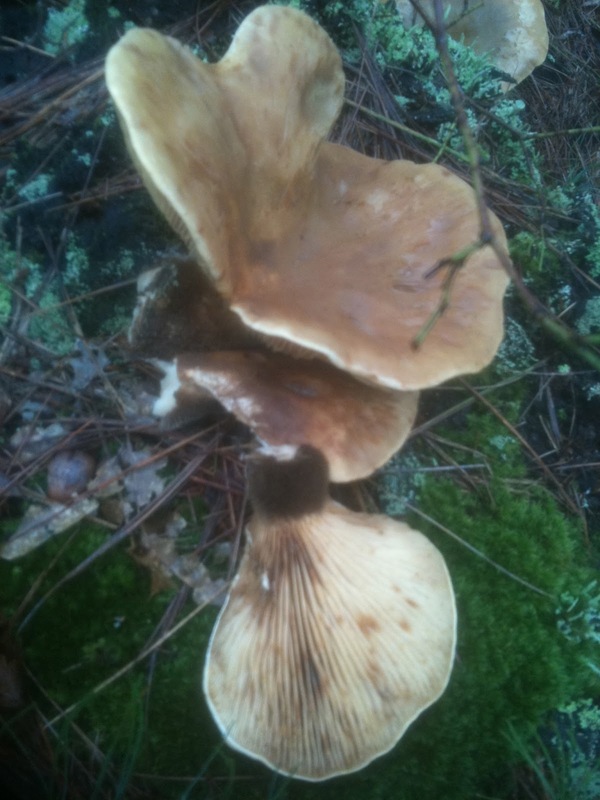 Note elongated stems on mushrooms in front. Too high CO2 levels most likely in humidity tent. 2.5 ounces harvested from initial flush- pretty tiny harvest. The second coffee chaff brick is starting to produce primordia- hopefully more mushrooms by the weekend! Pinheads forming on both of the chaff bricks. I tossed two more of the jute bags into the compost as they were getting moldy. Probably not enough airflow, plus not a high enough inoculation rate. Possibly not enough sterilization as well. At least 1 or 2 of the other jute bags may still provide mushrooms though! Of the 7 jute bags I inoculated here is where I stand. -2 are on the border- not sure if the molds or oyster mycelium will win. -1 is looking like it will achieve full colonization in the next week. -1 has been a rock star with colonization, and produced the nice cluster in photos above. It hasn't done much since then though- hopefully getting ready for a bigger second flush. The two chaff bricks are doing allright- forming a few more mushrooms. I think that a combination of too high CO2 and not enough light are stunting their growth. 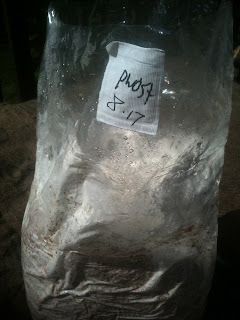 -Of the 4 remaining jute bags 1 is still struggling- but the oyster mycelium may beat out the molds. - The other three are all fully colonized and showing pin-head formation, but few actual mushrooms. Not sure if they are still to come, or if there is something I am missing. The chaff bricks are producing mushrooms in the same growing area- so perhaps there are nutrients missing from the jute bags? Total harvest since the start of this round is 4.3 ounces. Not great- but there still looks to be a good bit more. No signs of contamination/ fungal gnats/etc.. Season: Year round in your house plants! Defining characteristics: Growing indoors next to your houseplant. 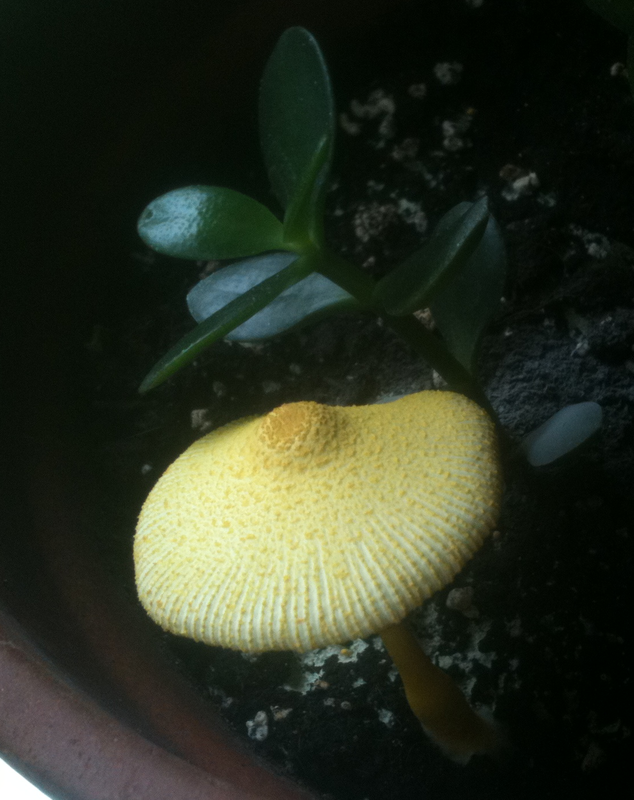 Entire mushroom is bright yellow with a small ring on the stem. Small spots/bumps on the cap with often a dark center. Confused with: Those tiny yellow paper umbrellas you find in tropical drinks. 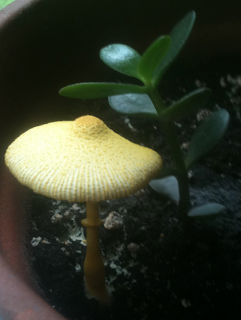 Yellow parasol visiting my jade plant. This fascinating little guy popped up in my jade plant last weekend. I thought it quite friendly of him to visit, given that I love fungi so much and rarely get a visit from a new species inside my own house! A quick internet search for yellow mushroom houseplant brought up plenty of information on my visitor. There doesn't seem to be a single agreed upon common name for the Leucocoprinus birnbaumii, so I am calling it the yellow parasol since is seems the most fitting option to me. Apparently they grow outside in the south on rich compost or manure quite frequently. Here in the northlands they show up in greenhouses and houseplants fairly often. Once they are in your pot- you probably won't get rid of them- so don't bother trying. I will see how often this guy produces a fruiting body and report back here whenever he does. Note the ring on the stem. Anyway- they are NOT edible- so don't try. Enjoy their beauty while it lasts- as mine appeared matured and wilted in about 4 days total. Edibility: Unique and delicious. Not for beginners due to potential confusion with dangerous species. Defining characteristics: Found near Eastern Hemlock and Jack Pine (at least in the new england region). Intense aroma that is decidedly Matsutake- think a combination of spicy cinnamon and musty socks. I am not aware of any other mushroom that smells like this- rich, earthy, spicy, and almost intoxicating. Growing very close to the ground, often with the stem several inches deep. 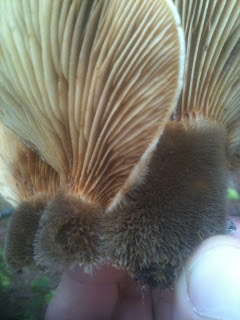 A veil covers the gills when immature, leaving a ring on the mature mushroom. There are often dark markings/stains on the cap and base of the stem. specimen on the right, and veil on the left. Matsutake is one of the most highly sought after mushrooms in Japan. The unique aroma, taste, and beauty of this mushroom have led to it being valued at hundreds of dollars a pound in Japan for prime specimens (young with a full veil and in pristine condition). The primary commercial harvesting areas are in the Pacific Northwest, however there are Matsutake to find here in New England. I have not found them in Rhode Island yet, but they are reported to be found on Cape Cod, and I have found them in Maine. They are also reported to be fairly common in parts of Quebec. You definitely want to be careful with identifying Matsutake. There is a condition known as mushroom collecting fever, where an excited forager thinks every mushroom they find just happens to be the long sought after delicious delicacy, with little regard to checking its defining characteristics. I only ate Matsutake that I collected after three years of searching for, and finding them. The first two years I collected what I thought where Matsutake (and now know they actually where), took photos, and read up on them. I was not fully convinced so I chose not to eat them. It wasn't until this year when I found the same mushrooms growing in the same spots, with the same aroma, and a couple more years of accumulated wisdom that I finally was sure of what I had. Matsutake on the left, golden chanterelles on the right. They are delicious, and the aroma is amazing. A little bit stinky, a little bit spicy, and a lot heady. After sautéing in a bit of butter and a dash of salt it is without comparison. There is a firm texture with a taste that is very complex. It is hard to describe it except as Matsutake-like. David Spahr has an excellent description of the Northeastern Matsutake on his website, and you can also read more at the Mushroom Expert or Tom Volk's website.